US demand for electric power transmission and distribution (T&D) equipment is expected to rise 5.5 percent annually through 2019 to $33.4 billion. Switchgear and pole and transmission line hardware will be the fastest growing products. The residential sector and industrial and nonutility generators will be the fastest growing markets. 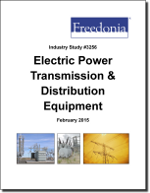 This study analyzes the $25.5 billion US electric power T&D equipment industry. It presents historical demand data (2004, 2009 and 2014) and forecasts for 2019 and 2024 by product (e.g., switchgear and switchboard apparatus, transformers, electric meters, pole and transmission line hardware) and market (e.g., electric utilities, industrial and nonutility generators, commercial sector, residential sector, government and institutions). The study also considers market environment factors, details industry structure, evaluates company market share, and profiles 34 industry competitors, including Eaton, Siemens, and ABB.